As a piano teacher of beginning students, one of the most common questions from my new students is: “Should I get a piano or a keyboard?” This is a great question since the answer not only helps the student determine what type of instrument they should buy, but also the correct recommendation can affect the student’s technique, motivation levels, and how much effort and money they invest into their music learning. The answer to this question depends on many factors, including the student’s budget, goals (casual vs. serious learner), space in the home, and other factors. To help the student assess which choice is correct for them, I put together a brief compilation of the advantages and disadvantages of each of the following types of keyboard instruments: grand piano (acoustic), upright piano (acoustic), digital piano, and electronic keyboard. In the end, the best choice is to get the highest option that is still within your budget and learning needs. A piano teacher will usually prefer an acoustic piano as this allows the student to start on an acoustic instrument from the very start, which will help develop the most ideal technique from the very beginning. 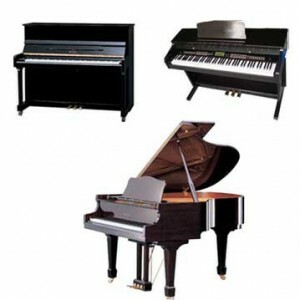 However, it is understood that a grand or upright piano is not always within the budget of the student. The keys are standard size. Hopefully with these recommendations, you will be on your way to choosing the right instrument for you. By considering your budget, learning goals, space constraints, and other factors mentioned above, you will be informed in your instrument purchase. To download a free handy comparison chart, please click below. Download Pianos vs. Digital Pianos vs. Keyboards Comparison Chart PDF file. Theresa Chen is based in the Los Angeles, CA area and is the owner of one of California’s premiere music schools, Opus Music School. She has a full studio of private piano students and also trains new piano teachers. Theresa has a Masters degree in Piano Pedagogy from California State University Fullerton and a Bachelors degree from UCLA. How Do I Get Perfect Pitch? As a music teacher, I have had music students ask me: “how do I get perfect pitch?” This is a tough question to answer, because there is little definitive medical guidance on perfect pitch, such as whether it is genetic or if it is a skill that can be learned. Growing up, I had perfect pitch but I don’t remember how I obtained it – I just don’t recall ever not having it. In this article, I will explore what perfect pitch is, why certain people have it, and recommendations on how you can obtain perfect pitch. In everyday terms, individuals with perfect pitch can name musical pitches accurately without having any reference point. For example, if someone plays a random note on a piano, a person with perfect pitch would be able to listen and name the correct note instantly without looking. When a piece of music is played on the radio, a person with perfect pitch would be able to identify the notes being played, including the notes of the chords and bass line. Relative pitch is similar but more limited. People with relative pitch can hear one identified original pitch, then identify other pitches relative to the stored memory of the original pitch. Why Do Certain People Have Perfect Pitch? Perfect pitch is rare among the general population. It is more prevalent among professional top level musicians that started music study at a young age, but even still it is quite rare. Most people with perfect pitch do not recall when they obtained it. Start at an early age – The majority of individuals with absolute pitch began formal musical training before age 7. Genetics – A sibling (with early musical training) of an absolute pitch possessor is about 15 times more likely to possess absolute pitch than is another individual with early musical training but with no family history of absolute pitch. Fades with time – Pitch perception tends to go sharp as subjects age. None of the subjects past the age of 51 identified all of the tones perfectly, unlike their younger counterparts. Distortion – Absolute pitch possessors tend to err on G# far more than any other tone (hypothesized given the use of A as the universal tuning pitch in Western music and there being varying frequency standards for A, i.e. A440). Research is still ongoing to find if there are genetic variants (i.e., DNA changes) that are enriched in individuals with absolute pitch. This study is a fascinating one, and one that we will surely keep our eyes on to see how it unfolds. How Can I Learn Perfect Pitch? People with perfect pitch appear to fall into two categories: one group who have always had the ability, and the other group who have acquired the ability at a later age. Interval identification – To help develop perfect pitch, you must first be adept at relative pitch ability. This involves learning to identify intervals accurately and instantaneously. Practice listening to random note intervals and recognizing patterns to identify them. My childhood piano teacher taught me the following mnemonic tools. For example, to identify a 4th interval, think of the Here Comes the Bride. To identify a 5th interval, think of the Star Wars theme. To identify a 6th interval, think of My Bonnie Lies over the Ocean. To identify a 7th interval, think of Somewhere Over the Rainbow (the 1st to 2nd note is an octave, then the 3rd note is the major 7th). Practice playing by ear – Try playing songs from ear as often as you can, without the help of any sheet music. This will train your ear to listen carefully and help identify relative pitches. Don’t worry if it is frustrating at first – part of ear training is trial and error until you can recognize patterns. Ear training exercises – There are numerous ear training software available, even free ones online, that one can access to practice developing your ear. This will include practicing the identification of notes, scales, chords, intervals, cadences, and others. Student enrollment in music exams such as ABRSM music exam or Certificate of Merit will train and test students in ear training. Keep playing music – The more you play, the more your ear listens to the instrument you’re playing. After many years of continuous practice, you will begin to be familiar with the timbre and frequency of certain notes, thus making them easier to identify. Try testing your perfect pitch periodically – Periodically, you may wish to have a friend or music teacher play random notes on your instrument and practice naming them instantaneously and as accurate as you can. Even if one is not born with perfect pitch, with patience and continuous practice, you can learn techniques to help develop the ability to obtain perfect pitch. If you intend to acquire perfect pitch, just be reminded that it often takes years to obtain. But don’t be discouraged – it is possible! Good luck in your journey, and happy listening! Theresa Chen is based in Los Angeles, CA and runs two music education websites, Opus Music Education and Opus Music Worksheets. If you are interested in joining one of the web’s premiere music teacher directories, please check out Opus Music Education at http://www.opusmusiceducation.com. To download free music education worksheets, visit http://www.opusmusicworksheets.com. Go back to Opus Music Education homepage. Group vs. Private Piano Lessons – Which One is Better? When parents consider starting their child in music lessons, often they wonder if private or group lessons would be better suited for their child. In this article, I discuss the advantages and disadvantages of private lessons and group lessons, and later conclude on my assessment of which type is better. Personalized attention – The student gets one-on-one attention from the teacher at all times of the lesson. This means the teacher can tailor the lesson concepts, pace of learning, and progression according to the capability of the student. Pace is customized – Music concepts are progressive and build upon previously learned topics. In a private setting, the teacher can go as fast or slow as needed to ensure the student comprehends all of the necessary music concepts before learning the next topics. Students with above-average musical aptitude can move at a much faster pace, which will reduce risk of boredom. On the other hand, students that need extra help can spend extra time with the teacher on certain areas to ensure they understand the concept fully before moving on. Faster progress – On average, students who take private lessons will progress faster in their music studies than those who take group lessons. Personal connection between student and teacher – Since the teacher and student will spend a lot of time together, a deeper personal connection can be developed between the two. Students who study for the same teacher for many years typically have a strong bond with the teacher. Easier to schedule – It may be simpler to schedule lessons since there are only two parties involved in a private lesson (teacher and student), unlike multiple parties in group lessons. More expensive – Private lessons can be considerably more expensive than group lessons. If a family is on a budget, the price differential can really make a difference. Solitary activity – Playing the piano is already a solitary activity, and a child may continue to feel that they are once again alone at their private lessons. Less expensive – The more people in the class, the less each student needs to pay. This can be a large determining factor for some families, especially given the current economic environment. Peer competition can be healthy – If a student knows that they will be performing in front of their peers, they may be more likely to practice their assigned pieces to avoid making mistakes in front of others. Also, they may have more incentive to do their homework if they do not wish to be the only student who didn’t finish their homework. Social time – Given the peer interaction of group classes, group lessons offer social time for the students. With multiple students, teachers have more flexibility to play games and hence, students may think lessons are more fun. Can learn from others – When students see other students their age and level play the piano, they can learn from observation, instead of a teacher verbally telling them. Ensemble skills – Playing in a group means that students are forced to listen more to their peers. This can develop their ensemble and ear training skills. Longer class time – Group classes are longer than private lessons (group lessons are typically an hour vs. 30 minute lessons for young children beginners). Less personalized attention – Instead of the teacher focusing on one student, the teacher must divide his or her time among many students at once. Different skill levels can be difficult – In a group setting there are lot of different types of learning styles. It can be difficult to handle the various learning styles and pace of learning. Less effective for shy students – Children who are shy or who don’t enjoy interacting in groups may be uncomfortable in group lessons. Group lessons usually use keyboards, not pianos – The piano is a large instrument. With multiple students, teachers typically do not have one piano per student. Instead, digital pianos or keyboards are used, which is different than an acoustic piano and can be less effective when the student reaches a more advanced level. Difficult to teach more advanced piano techniques – Once the level of piano study starts to involve playing with both hands and more advanced piano techniques, it may be more difficult for the teacher to work on the specific advanced details in the piece, such as phrasing, texture, balance between hands, touch, etc. Consider the following when assessing if your child is better suited for group or private piano lessons. Does your child like being in groups and work well with others? Do they like team sports? Do they have an extremely tight extracurricular schedule that makes it hard to find daily practice time? Are they under age 6? Are you under a tight budget? If so, group lessons are probably your first choice. Do they dislike team sports or shy around other peers? Are they exceptional students academically and tend to progress faster than other kids? Or do they tend to progress slower than other kids and sometimes require special personalized attention? Do they have a burning desire to learn the piano? Are they 6 or older? Can you afford private lessons? If so, private lessons are probably your first choice. In the end, the decision for a child to begin private or group lessons depends on a number of factors, including the child’s personality, developmental progress as compared to other children their age, and parent’s ability to afford the lessons. In my opinion, private lessons are always the preferred method since it ensures the student has a more comprehensive musical learning experience and allows the student to progress at their own pace (and often a faster pace as compared to other students). If parents can afford the cost of private lessons, private lessons are highly recommended for piano study. Theresa Chen runs two music education websites, Opus Music Education and Opus Music Worksheets. If you are interested in finding a music teacher in California, please check out Opus Music Education at http://www.opusmusiceducation.com. To download free music education worksheets, visit http://www.opusmusicworksheets.com. Opus Music School - A premier music school where Theresa teaches piano in Hacienda Heights, California. Opus Music Education - Find a music teacher in California. Opus Music Education offers a searchable database of music teachers and affordable private music lessons. Opus Music Worksheets - Free printable music theory worksheets, sheet music, studio business forms, and music education resources.